Sound and speak like a native. Your ideal pocket-sized companion for practising pronunciation, listening and becoming more confident, not just in speaking but in understanding others when abroad. Free ebook version with every copy. In all of the most common travel situations, you need the reassurance that you can communicate with ease. 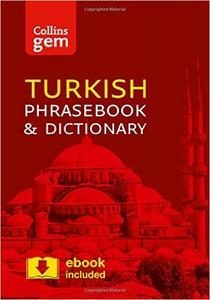 A reliable, portable and easy-to-use phrasebook is a travel essential, and with Collins Gem Turkish Phrasebook and Dictionary, the right word will always be at your fingertips. This indispensable language guide covers the topics and phrases that crop up every day on holiday, from finding a hotel and setting up your wifi, to going shopping.